A blog consisting my own personal, magical collection of all things Disneyana, and discussions about Disney collecting. Suggestions for your Disney collection. Some things here are for sale. This is the book, "Designing Disney" by Walt Disney Imagineer John Hench, with Imagineer Peggy Van Pelt. This features some very cool artwork, upon which the design of many Disney shows and attractions were based and built from. 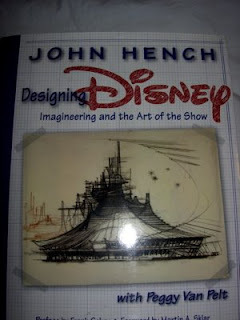 In the book, John talks about what Imagineering is, and what an Imagineer does. John worked at Disney as an animator in the beginning of his career at Disney. His artisitic ability and curiosity led him to become one of the premier Imagineers at WED Enterprises, which, years later, became known as Walt Disney Imagineering. John was also the master painter of Mickey Mouse for the Walt Disney Company, and since his death, he has not been replaced as such (although there will soon be a replacement for him). Walt Disney Imagineering is the master concept, design, and building organization created by Walt Disney himself. It was originally created to design and build Disneyland. Since then, it has designed and built all of Disney's theme parks, resorts and hotels all over the world, including at Walt Disney World Resort in Florida, Disneyland Paris Resort, Hong Kong Disneyland Resort, and Tokyo Disneyland Resort. In all, it has built 11 theme parks and the Disney Cruise Line. Wow. I got this book a few years ago at an NFFC Convention Show and Sale in Garden Grove, California. I got to the Convention a little late, and I saw the table where John was supposed to be, signing his book. I asked the lady sitting there, co-author Peggy Van Pelt, where John was, and she said that he had to leave. He had left her a few signed copies of his book, but she told me that she had run out of those, but she sold me a book and signed it book in front of me. I was a little disappointed, because I knew about John and I wanted to meet him and get his autograph in the book. About a month or so after that Convention, I read it in the news that John had passed away. I was sad about this, not only for the loss of a legendary Imagineer, but because I had never got the opportunity to meet him or to have my book signed. After hearing the news of his passing, I decided to pick up my book for the first time and really look at it. I stared at the beginning, and thumbed through the pages. Lo and behold, after turning a few pages, there was John's autograph, right in the book! I couldn't believe it! I don't know if Peggy knew that it was autographed or not when she gave it to me, but I tell you this, I believe in miracles! This book is so good and enjoyable to read and look at- I can spend an hour looking at it and reading it, and never get tired! Peggy Van Pelt died a few years back, so this copy of the book is truly non-duplicable! I am willing to part with this rare, autographed copy of "Designing Disney" for $500 plus shipping. See the latest from "mymagicalcollection.com"
To see our latest entries from this website, visit www.mymagicalcollection.com. To follow us on Twitter, click here to add us to your follow list! Thanks for coming to my website. There's a lot of cool stuff that I've blogged about on this site, so be sure to look around! All items featured here are copyrighted and trademarked by The Walt Disney Company, except as noted. This is a fan-produced site, and is in no way connected to The Walt Disney Company. Thank you for visiting "My Magical Collection"! Cool Cards From Disney's "The Princess and the Frog"
D23 Pin "Up All Night"
Framed Picture of Grumpy from "Snow White and the Seven Dwarfs"
Jose Carioca Sculpture from "Saludos Amigos" and "The Three Caballeros"
LP Record Disney's "America on Parade"
Photo from Wally Boag's Table at the 2009 "Be Our Guest Dinner"
Thrilling Sounds Of The Haunted House"
Walt Disney Classic Collection Belle - "Bookish Beauty"
Walt Disney Classic Collection Clarabelle Cow from "Symphony Hour"
Walt Disney Classic Collection- Ariel from "The Little Mermaid"
Walt Disney Classic Collection- The Magic Mirror from Walt Disney's "Snow White and the Seven Dwarfs"